Presidents come and go, but they pick judges for a lifetime. 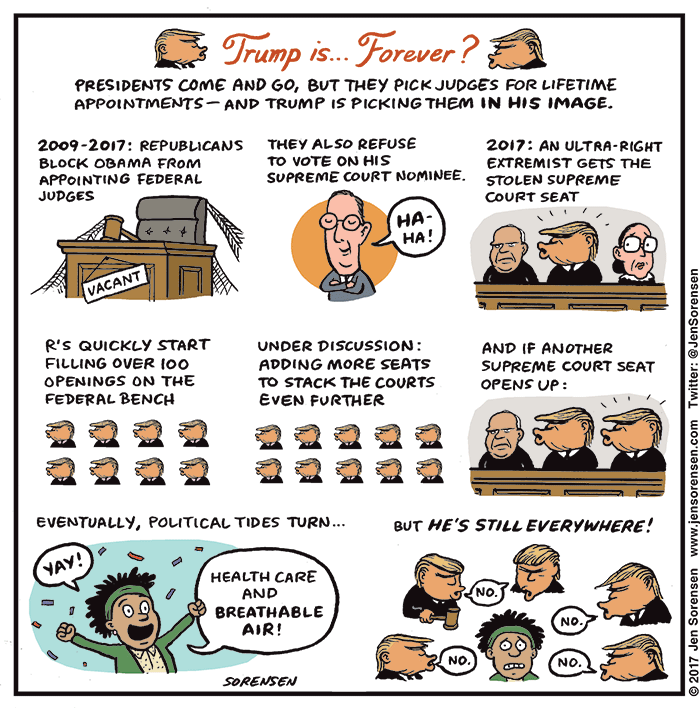 Cartoonist Jen Sorensen ponders the post-Trump future on U.S. federal court benches. Yikes! Well Berlusconi has made yet another come back in our neck of the woods, looking like a sinister Thunderbirds puppet. It’s like those awful horror films where you think the villain has finally be slain, but no…. Oh, bloody hell. Hopefully his revival will be as short-lived as Blair’s was. Let’s hope so, Amy – but things are so very bleak on the Italian political scene right now, that an 80 year old man looking like a puppet (because of all the plastic surgery and hair transplants) , and still under legal investigation, is seen as an injection of energy and vigour. Oy vei….. He could be a zombie, Lizzy. You have to chop their heads off or beat their brains out, don’t you, Amanda? So now he’s supporting Britain First? Whatever happened to America First? Perhaps it’s a result of the Meghan Markle sparkle and now he knows which side his upper crust is buttered. You read my mind, dear Geoff – he looks like a puppet, but I actually think he’s a zombie, so your tips are very useful…. The Guardian headline in 2012, after he made (another) comeback was the Mummy’s return, which is probably the most apt description for him.